Matt Bucy is a “Renaissance man” of many talents: real estate developer, pilot, architect, and electronics wizard. Vermont resident Bucy is on his town’s select board. He runs a flying club. And he is the director of photography for STAR TREK CONTINUES. One of the most consistent comments (and compliments) about Matt’s work behind the camera comes from fans who say that STAR TREK CONTINUES has “nailed” the look and feel of what came out of Studios 9 and 10 on the Desilu lot. And, in fact, the man behind the lens spent a great deal of time studying episodes of the original STAR TREK series to make note of how lighting was used to create depth, shadows, color, and texture. As Director of Photography and Co-Producer of STAR TREK CONTINUES, Matt works to keep the finished product faithful to what the fans of The Original Series expect. “It’s basically stage lighting, using hard light -- a key light, a fill light, and a backlight. So we’re using a lot of light sources. When you look at the 1960’s series with a critical eye on lighting, you’ll notice that they didn’t care much about multiple shadows. In fact, I think that’s one of the things that makes our production feel so similar – because there are shadows everywhere! Light is coming from above, usually at a 45 degree angle with the actors. And there are certain facial shadows that give STAR TREK CONTINUES a very “classic TREK” look,” says the self-taught cinematographer. 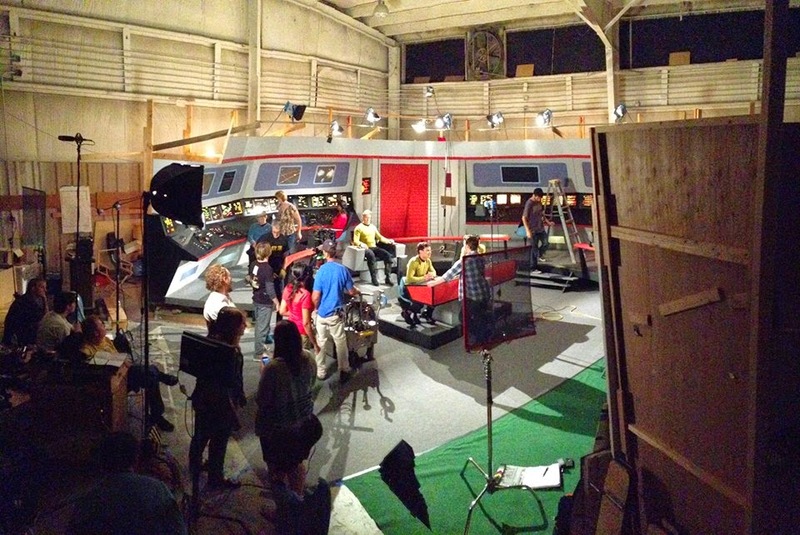 An episode of STAR TREK CONTINUES is typically shot on roughly the same weeklong schedule used by original producers. But technology of today also plays a role in achieving that vintage look. Bucy cut his teeth on the 60’s “look” to STAR TREK by loading more than 3,000 stills to his iPad from seasons two and three of the original series. “I looked at those stills very carefully. One trick that directors of photography use is to look at the eyeballs of the actors. If you study them carefully, you can see a big dot that is reflecting the key light. You can see how a light will pick up the hair and shoulders,” explains Bucy. The onscreen “look” of STAR TREK CONTINUES isn’t the only Bucy influence on the production. When the time came to flesh out the sets and recreate what used to stand on Stage 9 at Desilu, Bucy put his training as an architect to work to analyze existing blueprints of the original stage layout. The resulting set includes tall spires that stretch above the walls, which become perches for stage lighting. “That work to analyze and plan the corridor construction actually helped me determine where the lights would have been placed back in 1969. So the set actually plays a big role in that. Of course, they were also shooting on film – so that’s one major difference. And because of the sensitivity of the film, the sets would have been lit extremely bright, which is nothing like today’s TV lighting,” Bucy says. And where did he pick up the skills to wire futuristic bridge consoles? “I read the Harvard textbook on electronics,” Bucy says playfully. “STAR TREK CONTINUES isn’t the only thing I shoot. I also shoot features and shorts and usually do the color grading on the projects,” Matt says. You can find out more about him on MattBucy.com.